Psalm 23:5 — “Thou preparest a table before me in the presence of mine enemies: thou anointest my head with oil; my cup runneth over.” We are very familiar with the shepherd imagery in the Twenty-Third Psalm. Its opening lines are among the most famous and most beloved words in the Bible. But perhaps what we don’t think about so much is that the imagery changes – the Psalm ends with a different picture. It moves from a shepherd leading his flock, to a host serving his guests. It moves from fields and valleys, to a house and a table. 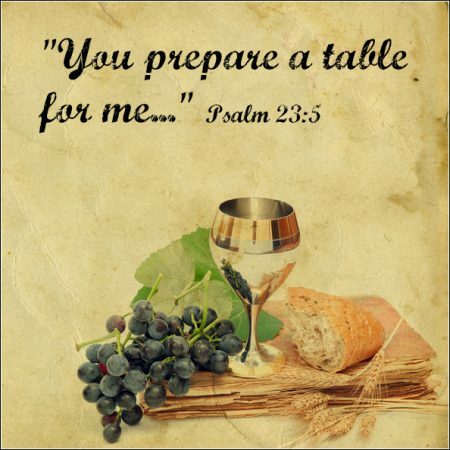 It is this second picture that we focus on in this sermon and how it speaks of Christ, the Gospel and the Lord’s Table. We are reminded of the abundant love, grace and blessing that God has given to us by means of His Son Jesus.